Retrain how your brain thinks about money. Recreate your relationship with money. 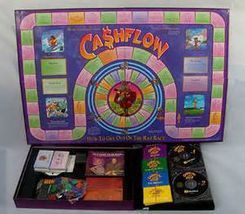 Come play Robert Kiyosaki's finance & investment board game, Cash Flow. A way to maneuver the savvy world of investment & finance without spending your own money. Is money a friend or a foe or merely an acquaintance? What programming around money have you bought into? What do you love about having no money? Is there such thing as too much money? How does money affect you? Are you willing to enjoy money? Does money like hanging out with you? Can you find joy with having money? If you threw a party, would money come? were willing to be filthy rich.